Todd will be competing in the Rimfire, Iron, and Open divisions of the US Steel National Championship on March 25-27 in Titusville, FL! Todd will be shooting the 2011 IDPA Indoor Nationals Championship, February 24-26, in Springfield, MA! Todd will be competing in the Steel Challenge World Championship on August 19-21 in Piru, CA. Todd has won the Iron Sight division three times and is looking forward to competing again this year with the world's fastest and most accurate shooters! Happy Independence Day! Thanks to all for your patience while Strike Force continues to develop its product line. Products will be available for sale very soon so please check back! I am looking forward to shooting the USPSA Area 1 Championship on June 25 in Idaho Falls, ID. This 12 stage match looks to be very challenging and fun! 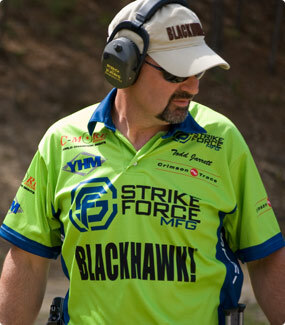 I'll also be competing in the 2010 Shooting Industry Masters with Team BLACKHAWK! on July 23-24 in Grand Island, Nebraska. The Industry Masters incorporates handgun, rifle and shotgun team events. I will be heading to the Raahauge's Sports Fair in Norco, California on June 4-6. I will be doing two shooting demos per day. This is the biggest shooting fair in the country and I hope to see some of you that live nearby!